Capable of HAB LV2 climb. REX was a specialized bot that was adept in scoring in the near switch and vault. It would fill the entire vault nearly every match, earning a Vault Master peer-award at Buckeye Regional from Team #2228. Robots-R-Us earns Regional Winner title! Robots-R-Us, a team of area high school students, traveled to Perry, Georgia and won the FIRST Robotics Competition; the Georgia Southern Classic Regional. Robots-R-Us, FRC team #3266, combined with FLASH, FRC #1319 from Greenville, SC (Greenville County Schools) and G3 Robotics, FRC #1648 from Atlanta, GA (Grady High School) to form the winning three team alliance. Recycle Rush is the FIRST 2015 challenge and alliance members worked together to build stacks of industrial totes topped with recycling trash bins. 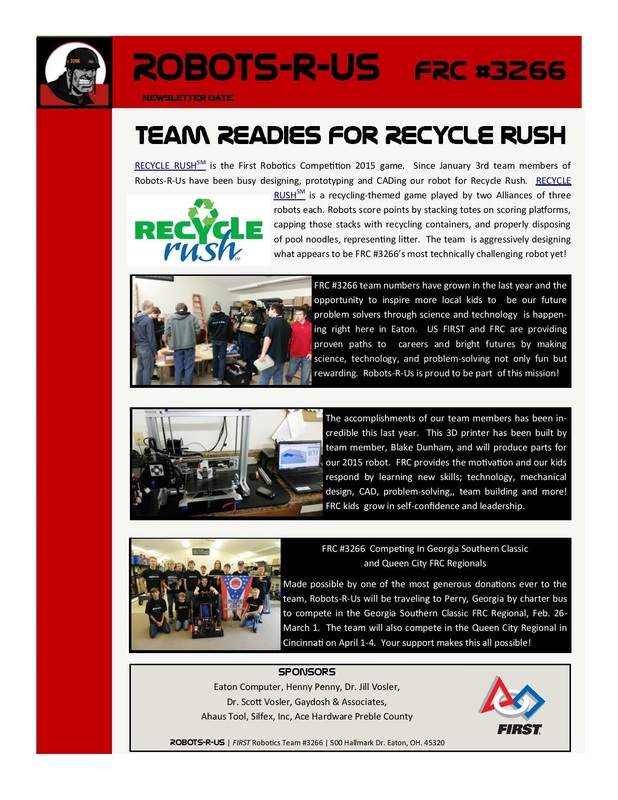 Over 3,000 FIRST teams from around the world had just six weeks to design and build robots for Recycle Rush. Teams of high school age kids compete in over 100 world wide regional and district events to earn a spot at the FIRST Championship in St. Louis, MO April 22-26. The local team with students from Richmond High School, Eaton High School, Preble-Shawnee High School and home school students will now make their first trip to the FIRST Championship to compete. U.S. FIRST organizes programs to inspire kids, 3rd through 12th grade, to become science and technology leaders by organizing exciting and fun robotic competitions. Using everything from Legos to computer programmed motor encoders team members learn how to work in teams to learn key science principles and how to solve challenges and tasks using technology. Robots-R-Us has been close to earning a spot to the FIRST Championships the last several years after qualifying in the number one spot at the FRC Queen City Regional the last two years. Robots-R-Us will perform at the 2015 Queen City Regional, April1-4 at the CINTAS Center in Cincinnati. The story was much different at the Georgia Southern Classic where Robots-R-Us had to overcome many diverse challenges the first two days of the competition finally finding its stride in the second half of qualifying rounds. The team missed all of their practice games due to having to rebuild and trouble shoot their drive and electrical systems. A faulty power distribution component delayed the team another 2 hours then the robot failed inspection due to being 11 pounds overweight. The next two hours were spent strategically eliminating components and parts that would not decrease the robots key performance areas. Learning to overcome obstacles and how to work together to solve problems are one of the benefits of the FIRST experience and were never truer than they were at the Georgia Southern Classic for Robots-R-Us. 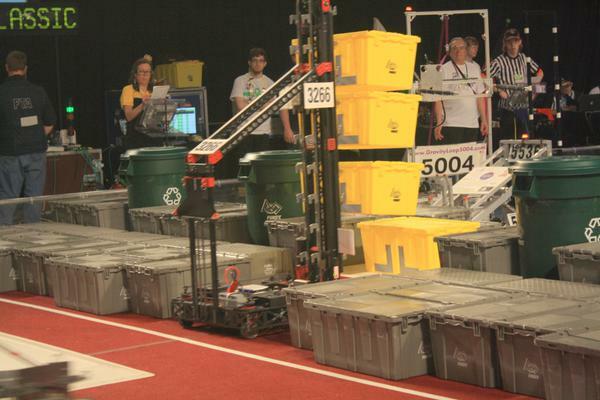 The team had just 11 qualifying matches to prove they could perform the challenges of Recycle Rush efficiently. After each of the first two matches various systems were dialed in and tweaked but then in the third match the gear box for the elevator system malfunctioned and the team had to break in and rebuild one of the systems that require the most time. The team missed their fourth match while repairing their worm gear assembly and barely made their fifth match. Robots-R-Us won that fifth match soundly and were back on track. So with just 3 matches of field time, 7.5 minutes, the team had dialed in all of the systems on the robot and were ready to compete. This team was not to be denied it was their ‘Destiny’ to overcome all barriers and earn their spot at the FIRST Championships. Robots-R-Us was selected as the third alliance member on the fourth alliance by Flash FRC #1319 along with G3 Robotics FRC #1648. The alliance went undefeated through the elimination matches winning 7 straight matches to win the FIRST Georgia Southern Classic Regional. DESTINY caps a stack of totes with a container and a noodle! DESTINY works on stacking some totes. DESTINY holds 3 yellow totes getting ready to score coop points during a qualification match. 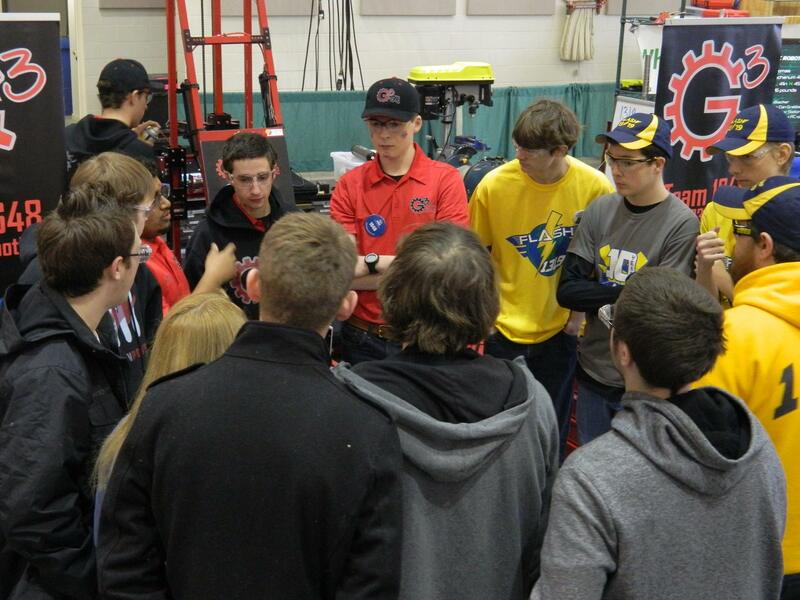 The fourth seed alliance meets before the playoff matches begin.